Fast Affordable Heat Pump Installation and Heat Pump repair Services from Virginia Beach to Chesapeake and Norfolk. If you're living in Virginia Beach, Chesapeake, Norfolk, or the greater Hampton Roads areas, a heat pump is a great way to provide both heating and cooling to your residence. During the winter a heat pump will draw heat from the ground or the outside air into your home. During our Virginia Beach summers a heat pump will take the heat from inside your home expelling the hot air from your home making the interior space cooler. Heat pumps use less energy than stand alone air conditioning and heating systems and can lower your energy costs significantly. ​Get a Heat Pump repair pro now. At Virginia Beach HVAC Services we install, repair, and maintain heat pump units throughout the Virginia Beach area. Our desire as a company is to provide the best services to our customers and clients. We have all the skills necessary to handle your heat pump's needs. 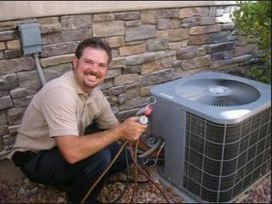 we also have the experience and knowledge to go about the installation, repair, or maintenance of a variety of heat pumps.